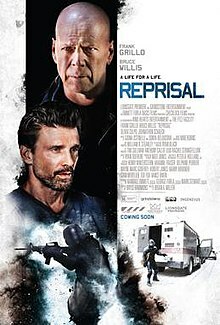 Reprisal is a 2018 American action thriller film directed by Brian A. Miller and written by Bryce Hammons. The film stars Bruce Willis, Frank Grillo, Johnathon Schaech, and Olivia Culpo. The project Reprisal was announced on February 21, 2017, that Emmett/Furla/Oasis Films had set Bruce Willis to star in the action thriller film, which would be directed by Brian A. Miller and produced by Randall Emmett and George Furla. On June 2, 2017, Olivia Culpo was cast in the film. Principal photography on the film began on August 7, 2017, in Cincinnati, Ohio. Reprisal has grossed a total worldwide of $103,904, plus $743,405 with home video sales. On review aggregator website Rotten Tomatoes, the film holds an approval rating of 0% based on 12 reviews, and an average rating of 2.2/10. On Metacritic, the film has a weighted average score of 19 out of 100, based on 9 critics, indicating "overwhelming dislike". ^ a b "Reprisal (2018)". The Numbers. Nash Information Services, LLC. Retrieved January 4, 2019. ^ Jr, Mike Fleming (February 21, 2017). "Bruce Willis Pacts Pair Of Films With Emmett/Furla/Oasis". Deadline. Retrieved August 14, 2017. ^ Hipes, Patrick (June 2, 2017). "Olivia Culpo Joins Bruce Willis In 'Reprisal'". Deadline. Retrieved August 14, 2017. ^ Armstrong, Kimberly (August 7, 2017). "'Reprisal' filming begins at Yeatman's Cove". Cincinnati.com. Retrieved August 8, 2017. ^ "Bruce Willis Film Shooting Near Roebling Suspension Bridge". The River City News. August 7, 2017. Retrieved August 8, 2017. ^ "Bruce Willis' 'Reprisal' movie (gun fights, car chases, a robbery, a crash) to be filming on riverfront Aug. 7-9 | NKyTribune". www.nkytribune.com. August 7, 2017. Retrieved August 8, 2017. ^ Kingery, Nikki (August 4, 2017). "Expect gunfire sounds, traffic snarls as Bruce Willis movie starts filming downtown". www.bizjournals.com. Retrieved August 8, 2017. ^ "Reprisal (2018)". Rotten Tomatoes. Fandango. Retrieved January 4, 2019. ^ "Reprisal Reviews". Metacritic. CBS Interactive. Retrieved January 4, 2019.